Sigh. Unfortunately, some Wiccans know the liturgical calendar better than Christians do. One may well ask how I could live so long without realizing that Candlemas and Groundhog Day are the same festival. No doubt they are related as Halloween is to All Saints' Day: a very old festival whose more recent, Christian lid has come loose, so that most people are unaware that the lid was ever there. These days, probably more Wiccans than Catholics are aware of Candlemas, since Candlemas is not a holy day of obligation. There is a liturgy for the day that involves cool stuff with candles, but you are likely to see it only if the feast falls on a Sunday, as it did last year. 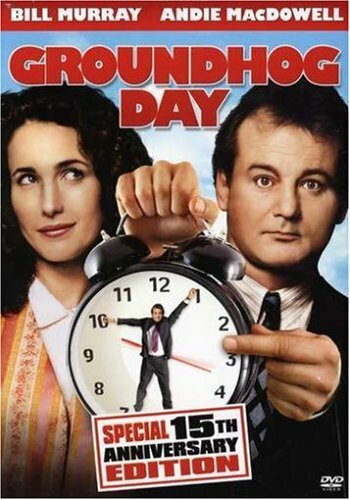 Groundhog Day is also the name of a movie about people trapped in a time loop, so that they have to repeat and repeat the day. That's why I bring it up, because it reflects the sense I get of the current presidential election. The parallels with the 1992 election would be spooky if they were not so unimaginative. Going into the election year, President Bush Senior was running on the recent victory in the Gulf War. He hoped that the economy, which had been in recession but was beginning to recover, would improve enough by Election Day that it would not be a factor. In that he was sorely mistaken; the Democrats framed the election in terms of economic issues and won. However, they did not neglect to systematically belittle the president's foreign-policy record. Beginning in the Fall of 1991, there was an endless stream of revisionist accounts of the Gulf War which argued that the war was unnecessary and that, in any case, the US had not really won at all. Today, when the stakes are higher by an order of magnitude, pretty much the same story is being put out, with surprisingly little attention to the change in circumstances. The result is not always very coherent. The Democratic senators at last week's hearings with former arms inspector David Kay asked for an independent inquiry into whether the Administration manipulated the intelligence it had received about the WMD situation in Iraq, when Kay had just told them that the intelligence agencies had told the president exactly what the president repeated to the public. It is hard to see how there can be manipulation when the output is the same as the input. Nonetheless, the Democrats will get their independent investigation. The benefit from the process, from their point of view, is less likely to be a final report that is damning to the Administration than the wrangles that will emerge over the Administration's unwillingness to answer some of the subpoenas the investigators will issue. The chief outcome of the Democratic repudiation of the Gulf War of 1990-1991 was that the world was put on notice that the United States would do nothing of the sort again, at least as long as a Democrat is in the White House. In today's world, that would mean that people living in countries under assault from the Islamists (not a small number of countries) would be best advised to make what accommodation they can with the jihad. Meanwhile, on the surface, the UN would be abuzz with new international law-enforcement and arms-control initiatives. The results really are predictable. I have a nightmare image of President Kerry's curiously immobile face, speaking to the nation from an extremely secure location as the fallout settles from the nuke in the rental truck that took out Wall Street. Should we not repeat 1992, there is always 1972. The Eastern Establishment (for want of a better term) never accepted the presidency of Richard Nixon as legitimate. When he was reelected, his opponents no longer cut him the slack that is customary in a democracy. Ronald Reagan, with his privately funded covert action unit that came to light in the Iran-Contra scandal, had arguably committed acts far more worthy of impeachment than ever Richard Nixon did. However, few responsible people really wanted to see Reagan removed from office, so the Democrats didn't push the button. They did for Nixon. They will for George W. Bush. Again, the impeachment of Bill Clinton, which I daily regret having briefly supported, set a very low standard for beginning the process of removal. All that stands between GWB and a serious attempt to remove him from office is the Republican control of both houses of Congress, which is a slender margin of safety. And speaking of slender margins: if President Bush wins in 2004 only in the Electoral College again, there will be gunfire. Possibly the jihad would acquire domestic allies in the US (not all the links need be on the Left, by the way). It is a mystery to me why the College has not been reformed, after the wake-up call of 2000. We will deeply regret having neglected the matter. On a less alarming note: I have been pestering people about my new review of David Frum and Richard Perle's book, An End to Evil. The Federal Papers it ain't, but it is the flavor of the month.